Ted Cruz is moving to Donald Trump’s right on immigration. Yes, the Texas senator is moving to Trump’s right. And that has the GOP losing its mind. Ted Cruz and Donald Trump. Sen. Ted Cruz has offered a gift to the political media that’s constantly trying to goad him and Donald Trump into fighting: He apparently doesn’t think that Trump is sufficiently anti-immigration. “Absolutely, yes,” Cruz says. “We should enforce the law.” Here, he seems to leave a little space open for the “self-deportation” that dominates his immigration plan rather than the more forceful mass deportation that Trump supports. Not that immigration activists regard either as particularly humane. But then, on his own volition, Cruz leapfrogs to Trump’s right: “And in fact, look, there’s a difference. He’s advocated allowing folks to come back in and become citizens. I oppose that.” He then name-checks Congress’s two most cherished anti-immigration conservatives, Rep. Steve King and Sen. Jeff Sessions, as collaborators on his immigration plan. Cruz is mostly correct about Trump’s position, if you believe that the latter’s off-the-cuff riffing constitutes a policy position. Trump has stated, as Cruz does in the video, that he supports deporting all 11 million undocumented immigrants residing in the United States. But he also has said that he would allow the “good ones” to then return after deportation to obtain “legal status”—not citizenship, as Cruz claims. Like many Trump positions, the policy itself matches the thought process through which it was deliberated almost verbatim: Well we have to get rid of all of them, because illegal immigration is bad, but that doesn’t sound very nice at all, so we will let the good ones back in, though not to be citizens. How’s that? Cruz, who spent much of 2015 gushing about how “grateful” he was for Trump’s contribution to the immigration debate, has decided to attack Trump as a supporter of amnesty. This is a few things. First, it’s amazing. Trump, who has gone so far as to call for a ban on Muslims’ entry into the country, will now be portrayed as insufficiently “tough” on immigration. It’s also a nice check of how far Cruz, in his effort to keep up with (and now surpass) Trump’s rightward lunge on immigration, has moved to the right on this issue in the past year. When Cruz entered the race, he was already far right on immigration. He has since moved further, rejecting even the slimmest possibility that he might consider a plan granting legal status to undocumented immigrants, as well as renouncing his previous support for increasing legal immigration levels for skilled workers. 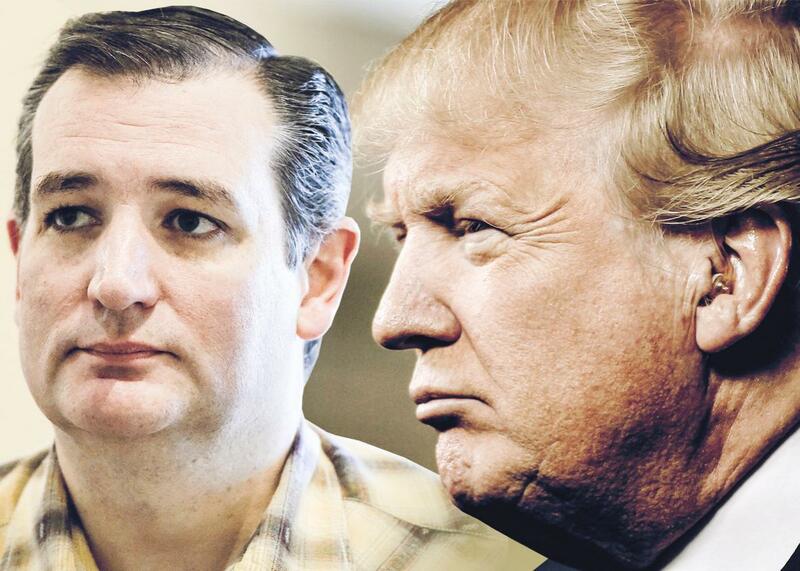 Trump and Cruz both support eliminating birthright citizenship, too, for what it’s worth. This is not Rick Perry and Michele Bachmann desperately trading aspersions into the void about the other’s secret love for undocumented immigrants. We are talking about the two leading Republican candidates who capture a majority of voters’ support between them and have the two clearest paths to the nomination, less than a month before voting begins. The simplest forecast for how the next two months will play out is that these two trade wins in the early states and the dozen or so Southern contests that follow, while Sen. Marco Rubio bides his time and waits for something to happen on more favorable, winner-take-all grounds. “Waiting for something to happen after losing early states” has never been a winning strategy, and if a Rubio, Jeb Bush, or Gov. Chris Christie thinks he could at least pluck off a Massachusetts, he should take a look at this. Politico on Tuesday offered its latest update about the “establishment,” a term we use loosely to describe Republicans who believe that a Trump or Cruz nomination would mark the party’s electoral Armageddon, losing its mind over the probability of a Trump or Cruz nomination. Mitt Romney is making calls! Well-connected operatives are once again mulling a Stop Trump campaign! They have “offered detailed presentations” of said campaigns! They are correct to be worried, especially since there’s not much more they can do. So let’s make them feel even more lowly: It’s going to get much worse if Trump and Cruz end up fighting against each other for the largest chunk of the electorate down the stretch. Cruz has indicated that he will jump to Trump’s right on immigration, which will likely cause Trump to move to his own right, against any eventual legal status, to maintain his anti-immigration base. From there, the two leading candidates for the nomination will have taken extremely severe positions against immigration reform, though they will bicker about how the other is weak nevertheless. And so the race to the bottom extends for several more months. This is a hackneyed observation, but I’m going to make it again because it tickles me: Imagine telling the RNC in 2013, when its “autopsy” of the 2012 election stated that the party must champion comprehensive immigration reform in order to win the presidency, that the nomination would likely come down to Donald Trump and Sen. Ted Cruz, and that it would be fought over immigration and who can take the most rejectionist stance. Cruz, oddly enough, subscribes to the official GOP strategists’ theory that the Republican presidential candidate must win 40 percent of the Hispanic vote in order to secure the presidency, compared to the 27 percent Romney earned in 2012. He argues that he can do so because most Hispanic voters don’t vote based on immigration reform. That may be true, but the sentiments that such hard-line anti-immigration messages inspire (and are catered to in the first place) turn off many, many Hispanic voters from hearing anything else the GOP may want to say. Perhaps Cruz is relying on his last name to do the trick. It would really be helpful to the Republican Party if a candidate not named Trump or Cruz won New Hampshire. A quick look at the scene there suggests that all the establishment-acceptable candidates are destroying each other. In that case, never mind.